Nepal has been the focus of outstanding achievements in the world of peak climbing expeditions, with its eight peaks above 8000 meters. It has challenged the minds and bodies of those who have dared for decades. Among the identified 1310 peaks above 6000 meter, one quarter are officially opened for mountaineering activities, including the 'trekking peaks'. Climbing these peaks is the next step beyond 'simply' trekking, before scaling the 8000-meter peaks. Most of trekking peaks (6500m below peaks) are listed in with Nepal mountaineering association, an official mountaineering association of the Nepal. 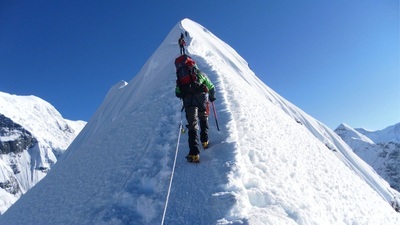 There are more than 20 peaks below 6500m opened for alpine climbing. 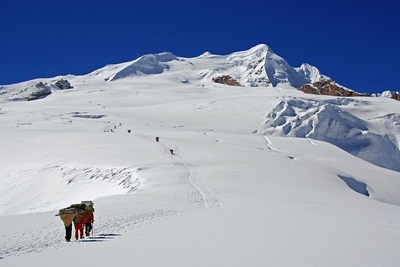 Peaks below 6500m are the second step for the trekkers who are willing for mountaineering course afterward. It is true that the previous mountaineering experience is not necessary to climb these trekking peaks however; you must be prepared mentally as well as physically for these adventurous expeditions.